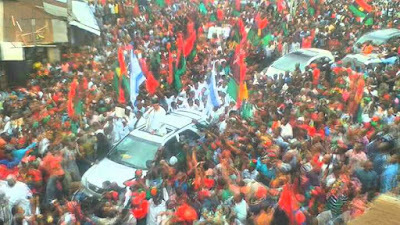 It has become very glaringly clear that Biafrans have no better time to ferociously defend their resolve than now in keeping their God given inheritance, in the face of series of provocative treatments from the Nigeria Government. We have over time demonstrated our friendliness, forgiveness and maturity towards our enemies within the Nigerian contraption without any recourse. We have come to the red line by comprehensively reconsidering the activation clause of self - defense. Further postponement of a united action against this evolving madness of the Nigerian government being unrelentlessly unleashed against Biafrans will no longer be considered, the resultant effects nonetheless. Biafrans can no longer tolerate these vampires and savages desecrate our land. Should we keep watching these futajalonic misfits from the North lay siege on our lands and killing unarmed, innocent Biafrans? It has become very exceptionally unbearable watching these uncircumcised terrorists invade Biafraland at will to enslave us. It is now undoubtedly expedient for us to pay these marauders in their own coin. We have bore the griefs and the pains, eschewing all forms of violence in our struggle even in the face of uncountless number of provocations. Freedom is a right to all humans the world over and that we must get come what may, both for ourselves and for our upcoming generations. We have exhibited maximum civility, decorum, maturity, understanding and diplomacy in our approaches towards the restoration objectives as a people. The United Nations laws have judiciously been employed hoping that the World body and other reputable affiliate organizations will see reasons to come to our aid. The events of Sunday 10th September 2017, where these Boko Haramised Nigeria army invaded the residence of the leader of the Indigenous People Of Biafra (IPOB), Nnamdi Kanu and shot at armless, innocent Biafrans with various degrees of injuries, can never be condoned. It is equally correct to emphasise at this point that the British particularly, have remained indolent in the light of the prevailing incidents of inhumanity in Nigeria because of their crass egocentric interests. They have to be informed however, that Biafrans' are more than ever before very determined in their quest for freedom. Our capacity as a people should never be undermined as we remain the only epitome of the liberation of black Africans. The continued silence of these white supremacists over the plight of Biafrans in the hands of these Hausa-Fulani oligarchists is to say the least most callous. Africans must unite and fight for their total emancipation from the hands of these invading emigrants and their foreign demigods. They have thrived over the times, watching Africans fight and kill one another with the arms and ammunitions shipped into the continent to grossly dismember us. But one thing is certain, we Biafrans will fight to fully and totally liberate ourselves from the shackles of enslavement and impoverishment from these vampiric Islamic stooges who are being shamelessly sponsored and supported the British. This is the time to fight for our freedom and that of our posterity, casting into oblivion, the tormenting fear of Islamisation. We will fight for the freedom of expression and decision, live within that freedom unlimited, with every structural provision adequately made for our comfort both economically and socially. We shall never trifle with this opportunity to further consolidate our sacrifices for our blessed destiny. Biafrans are already facing life threatening experiences and the best option for us is to confront them headlong with our resilience and resolve. It is a taboo to take the back seat and keep watching our women being raped by these marauding dirty, uncircumcised, terroristic Islamic Imams, and eventually forcefully get married to them without any protest. We should stand tall against these Hausa-Fulani vampires who invade our farmlands with their cattle at will. We must resist the impending sharialogy on our people. We must firmly resist them because our silence and inaction will inadvertently, endorse their jihadistic drive in Biafraland. We cannot afford to trade our freedom and values as a people. This is the time to raise the bar in our chequered match to freedom. 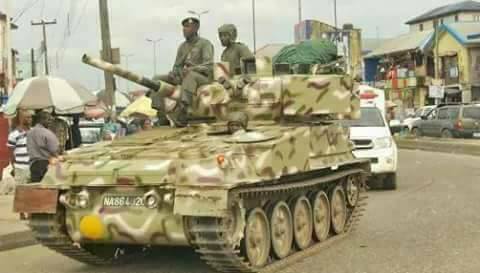 THE CABAL BLOOD MONGERS ISLAMIC DOMINATED HAUSA/ FULANI NIGERIA ARMY MUST REGRET THIS INVASION & WAR AGAINST THE PEACEFUL BIAFRANS SOONER OR LATER. GOD WILL NOW AVENGE & FIGHT FOR US ANYWAY! WATCH OUT, EXCEPT YOU REPENT NOW,YOU PEOPLE WILL REGRET @ LAST! - PYTHON MAD DANCE VERY WELL AND LEAVE BIAFRAN PEACEFUL LAND WITH IMMEDIATE EFFECT NOW OR REGRET IT EARNESLY! !